「익산 심곡사 칠층석탑 출토 금동불감 및 금동아미타여래칠존좌상」은 2012년 6월 석탑의 해체 수리시, 지대석 윗면에 마련된 사각형의 홈(25.0×24.0cm, 깊이 18.0cm)에서 발견되었다. 불감은 밑판, 좌우측면판, 뒤판, 뚜껑 등이 각각 1판으로 제작되었고 문비만 2판으로 제작되었다. 뚜껑은 지붕의 네 면의 모를 죽인 녹정형(盝頂形)으로 정상에는 2개의 고리가 달려 있다. 감실의 내면 중앙벽면에는 타출기법으로 아미타여래설법도를 나타내었고, 문비에는 역동적인 금강역사를 배치하였다. 7구의 불상은 불감의 앞쪽에서 아미타여래와 관음·대세지보살상이 발견되었고, 뒤쪽에서 2구의 여래와 관음보살과 지장보살이 발견되었다. 이들 불상은 대체로 높은 육계、큼직한 연봉모양의 정상계주, 잘록한 허리와 육감적인 신체표현과 감각적인 세부 표현, 삼각형 모양으로 仰․覆蓮이 맞닿은 연화좌, 원반모양의 귀고리, U자형으로 두껍게 늘어진 목걸이 등을 보이고 있다. 이는 이 시기에 크게 유행했던 元․明代 라마불교의 영향을 받아 제작된 여말선초기 소형 금동불상들과 양식적으로 상통하는 요소이다. 7구의 불상은 2개의 양식군으로 분류되는데, 라마불상양식을 강하게 반영한 아미타여래삼존상과 이들 양식을 수용하여 어느 정도 우리식으로 변모시킨 4구의 불·보살상으로 구분된다. 따라서 이들 불상을 통해 여말선초기 원․명대 외래 양식의 전래와 수용 과정을 살필 수 있어 더할 나위 없이 중요하며, 또한 분명한 출토지에 7구의 불상이 모두 한 불감 내 온전한 형태로 발견되었다는 점에서 지정가치가 크다. This collection of gilt-bronze objects, comprising a portable shrine and seven Amitabha Buddha statuettes, was discovered inside a square cavity (25×24×18cm) made in the upper part of the foundation stone supporting the seven-story stone pagoda of Simgoksa Temple when it was dismantled for repairs in June 2012. The shrine consists of three bronze plates, one of which forms the bottom, sides and top, while the other two form the pair of door leaves on the front side. 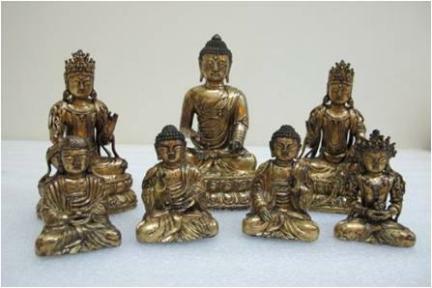 The seven Buddhist statuettes are arranged in two groups, a triad consisting of Amitabha and two attendants in a style originating from Lamaist art, and a tetrad of Buddhas and bodhisattvas made in a style closer to the Korean aesthetic tradition. Preserved in excellent condition and containing interesting clues about the influence of foreign art, and Yuan and Ming art in particular, the relics are considered worthy of inclusion on Korea's national cultural heritage list.